After hopping on the Serial bandwagon earlier this year I realized that there was a whole world of podcasts I was missing out on. I listen to some really great ones that deal with books, most notably Fresh Air from NPR and Books on the Nightstand. I never thought however, that I would find a group of people that I identify with like I do with Kait and Renata from The Worst Bestsellers. I came across this podcast after it was mentioned on NPR’s Pop Culture Happy Hour, and it is exactly what the title claims it to be, discussions about the Worst Bestsellers. My friends and I had discussed doing something similar and starting a book club where we would read just terrible books, Modelland was always going to be the first on that list. The Modelland episode of this podcast totally hooked me in and I proceeded to work my way through their back episodes. Essentially in each episode Kait, Renata, and a special guest give a brief overview of the book in question, go through the major plot points, discussing how absurd many things are, play a game of would you rather, and then suggest a candy pairing for the book. They also have a section called “Readers Advisory,” where they suggest books/tv shows/movies to read/watch instead of the book in question. More often than not the suggestion involves watching Ru Paul’s Drag Race. This is just one of the reasons why I love this podcast; I am just so happy that there are other people in this world who acknowledge that Drag Race is the best thing on TV right now. For those looking for a taste, I highly recommend listening to their episode on The Secret. I don’t think I’ve ever laughed quite as hard, and The Secret has become a running joke throughout the rest of their episodes (that and their “sponsorship” by ChristianMingle.com). Not only are Kait and Renata incredibly funny, but they are also both very smart and clearly knowledgeable about books. Listening to the podcast is like sitting among a group of friends and I am so glad I found them. This entry was posted in Friday Finds and tagged Books, Christian Mingle, Friday Finds, NFS Bookclub, Podcast, RuPauls Drag Race, The Secret Works, The Worst Bestsellers on May 1, 2015 by kwils3. Happy Friday Everyone. I wanted to share this fun little cookbook I recently purchased from the Culinary Historians of Canada. 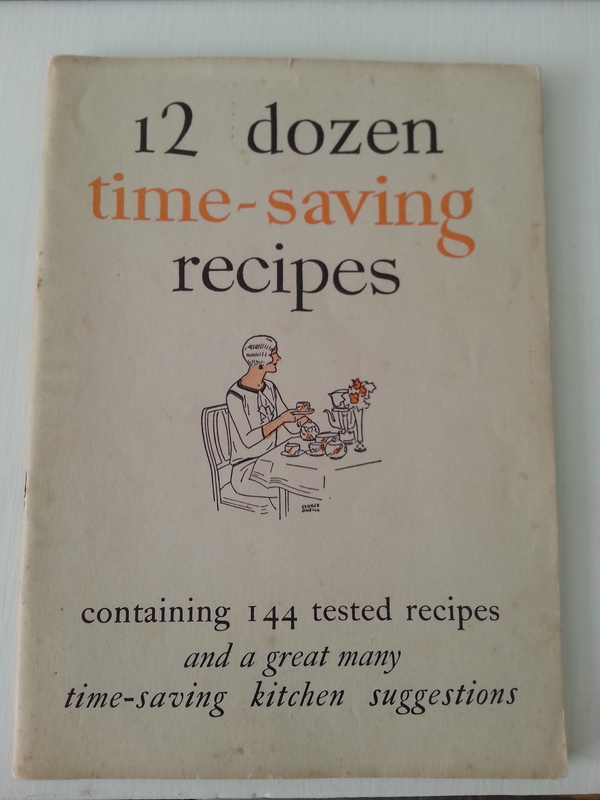 It contains 144 recipes and “a great many time-saving kitchen suggestions,” and was published by Proctor and Gamble in 1932. It should not be surprising that this little book is targeted at women and is designed to make their life at home easier by providing recipes for meals that are simple and easy to prepare, “For today, activities outside the home are demanding more and more of women’s time.” The role of women was certainly in flux during this time, and with the Economic Depression of the 1930s, this booklet is aimed at saving not only time but also money. Enter Crisco. Being published by Proctor and Gamble means that many of the recipes contained push P&G products, most notably this Pure Vegetable Shortening. 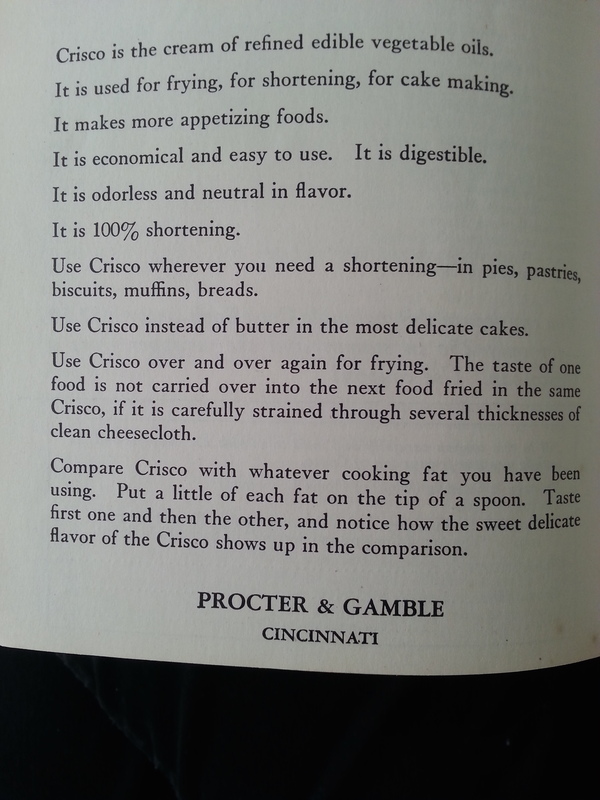 Crisco was introduced by Proctor and Gamble in 1911, and every single recipe in this booklet calls for it. 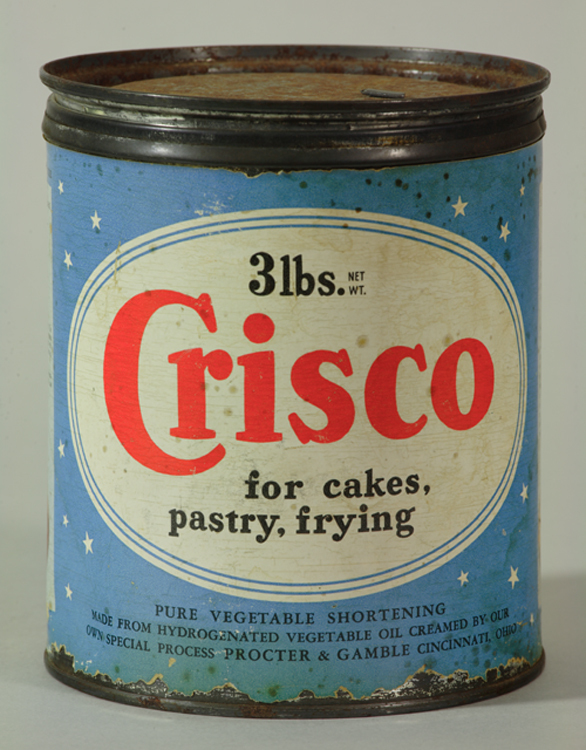 It’s easy to see why Crisco was so appealing, made out of vegetables, Crisco was promoted as being a healthier alternative to lard or butter. In addition, Crisco stays fresh and solid for a long time and does not need to be refrigerated. In the midst of an economic depression, many families relied on food that had longevity. Crisco is something that we still use today and its popularity is actually credited to the publication of free cookbooks that feature the ingredient. My mom, for one, still uses Crisco to ensure her pie crusts are flaky and melt-in-your-mouth delicious. In fact the recipes for pastry and pies in this book look similar to the recipes we would use today. A recipe for a flaky pie crust contains 2 cups of flour, 1 teaspoon of salt, 2/3 cups of Crisco, and Cold Water. Being the 1930s however, some recipes seem totally revolting. The recipe for “Crisco Sandwich Spread,” “Sardine Paste,” or “Fried Ham Cake” for example. While I cannot fathom using Crisco as a sandwich spread the recipe contained in this book is intriguing. I think next week I might make it my mission to try some of these recipes. Stay tuned! This entry was posted in Friday Finds and tagged 1930s, Cookbook, Crisco, Culinary Historians of Canada, Proctor and Gamble, Recipes on January 2, 2015 by kwils3.